ASM #46 starts rather abruptly. Spidey, his arm still in a sling from his battle with the Lizard in #44, encounters the Shocker, a guy with special vibrating gloves which give him extraordinary power. He kayos Peter and gets away. The next big event in Peter's life comes later. Harry Osborn's dad has rented an apartment for him close to Empire State U. He invites Peter to take the second bedroom. 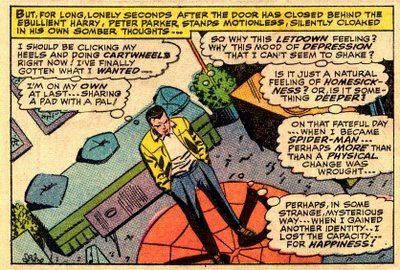 Of course, our hero is thrilled at the prospect, but has to figure out whether it would be an inconvenience to Aunt May. Fortunately, she has already decided to move in with Anna Watson, so for once things seem to be breaking Peter's way. 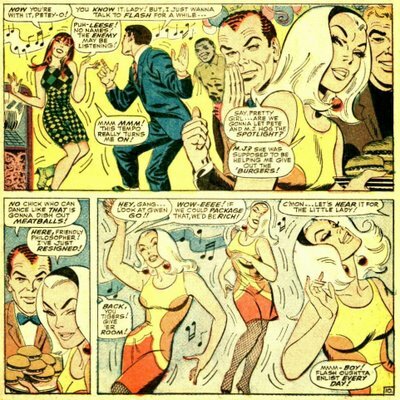 At this point he appears to be casually dating Mary Jane, but Gwen is starting to interest him more. Kraven returns in #47, as well as (briefly, in flashback) the Green Goblin. We learn that Gobby had hired Kraven to attack Spiderman in ASM #34, something that was not disclosed at that time. In addition, Norman Osborn himself (aka the Green Goblin) had acted as a go-between, exposing himself as a crook to Kraven. But eventually the battle starts. 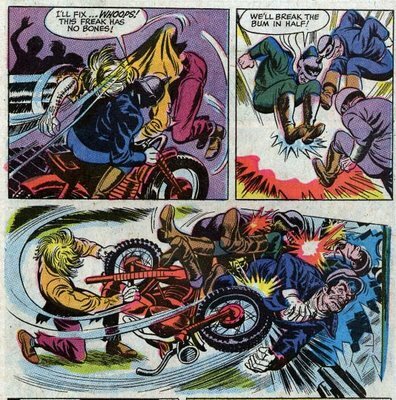 Kraven decides to kidnap Harry, who's with Peter at a going-away party for Flash Thompson, who's been drafted into the army as discussed in earlier issues. Peter sneaks away and reappears as Spiderman. He taunts Kraven into dropping Harry and they fight. This time Kraven defeats him with his ray, but stops short of killing him when Norman Osborn shows up. However Kraven is baffled when his jungle senses tell him that Osborn doesn't remember him at all. Of course, he had no way of knowing that Osborn has amnesia about his Green Goblin years. Kraven decides that his victory over Spiderman is enough and dashes off. Of all the weird heroes to arise at the end of the Silver Age, and there were a lot of them, perhaps none was weirder than Brother Power, the Geek. A creation of Joe Simon, the less famous half of the Simon & Kirby team, Brother Power came to life via spontaneous generation. He was originally a tailor's dummy, but combined with the heat from a radiator, a little machine oil, and a spark from a bolt of lightning, he came to life. In the first issue he's kidnapped to be a featured attraction at a carnival freak show, but his hippie buddies rescue him. He decides he wants to become a politician, but the carnival operators convince the cops to arrest him for breaking up their tents. At the end of the first issue he drives off the Golden Gate Bridge. In the second issue, after being pulled from the deep by another group of losers, and almost kidnapped by a bizarre Baron with a Fokker biplane (sic), Brother Power goes into the world of business. He rapidly moves up the ladder, with smart thinking and hard work. Eventually he runs a major missile plant, beating out a villain named Lord Sliderule. But Sliderule gets revenge by sabotaging a missile launch. BP is once again wanted by the police. He sneaks into the missile in an attempt to escape but Lord Sliderule blasts it into space. The hippies manage to convince the cops that LS is to blame for the problem with the missile launch, but in the meantime, what will happen to Brother Power? Despite the promise of a next issue, none appeared and Brother Power, The Geek was sidelined for several decades, although he did pop up in a couple comics in the 1990s. In retrospect, it seems like DC had decided to try to go after the burgeoning hippie market. 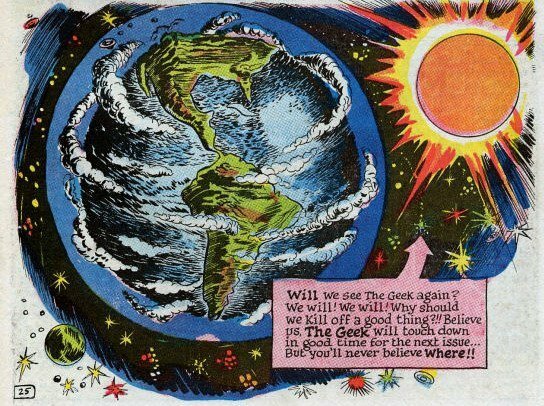 In some ways this seems inspired, but of course as with much that DC did back then, it was half-hearted. It poked fun at the hippies for their laid-back lifestyle and while this was certainly a fair criticism, it did undercut the marketing to many teens who saw the hippies as role models (mostly because they were their older brothers). This Wikipedia entry certainly indicates that BPtG was controversial in DC's halls. While sales of the title were modest, Brother Power was not popular among the staff. DC Comics artist Carmine Infantino claimed in an interview that Superman editor Mort Weisinger disliked the character very strongly, and petitioned DC publisher Jack Liebowitz to shut down the title. Weisinger hated hippies and felt that Simon portrayed them too sympathetically.